Found a very disturbing paper yesterday. One that show that vitamin C in pears is decimated by cool storage. The level of vitamin C upon picking was 43 mg/kg. However 15 days later it was only 15 mg/kg. That is a massive reduction to only 35% of the original level after 15 days. Yet I purchased pears the other week from the supermarket. These were NZ grown (I assume) and tasted OK. Yet these would have been harvested in June (or earlier!). So were at least 15 days since picking! And after 6 months in modified atmosphere storage was a measly 2 mg/kg. That is 4.5% of the original level. 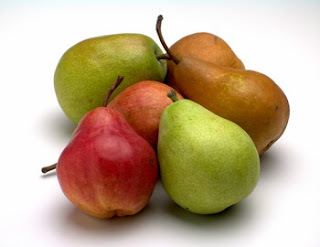 As a small aside the literature review pears could have 72 mg/kg or 26-45 mg/kg. Thus you can see that food tables are really lacking in concrete data! Interesting enough there was variation between the pears picked from low or high on the tree. The low trees had 1/2 to 1/3 level of vitamin C than the high ones. So make sure next time you go to the fruit shop / supermarket that you ask for the pears harvested from the top of the tree. (sorry couldn't help it, I know that this information is unavailable). Also one harvest was twice the level of another harvest (there was only three harvests altogether! ).